Which silver? Paper silver or real silver? What’s wrong with paper silver? Paper silver has been aggressively sold and that pushes prices down – just the opposite of what occurred between 2009 and April 2011. What is wrong with paper silver is … probably nothing. Buyers and sellers do their thing, sometimes in fractions of a second, and they define a price for paper. What’s wrong with physical silver? The usual – the paper markets set the price for the physical markets and drive prices to unsustainable highs and lows. We are currently at the low end of the cycle. How do we know the price is low and due to turn up? Of course we have no guarantee (my crystal ball is being repaired) but we can look at the demand and charts. 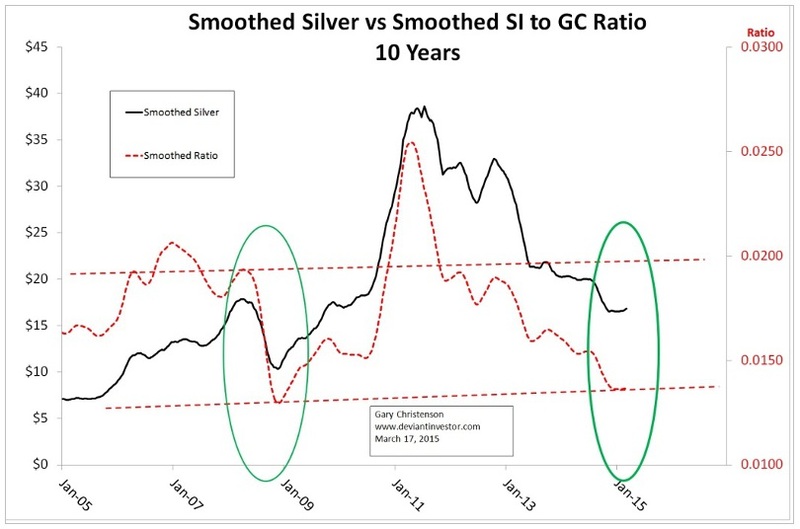 Steve St. Angelo publishes excellent analysis on physical supply and demand for silver. Read his many articles, but a summary is: silver supply is weak and global investment demand is strong, especially at these prices. The silver to gold ratio shows a clear pattern for the past 44 years. 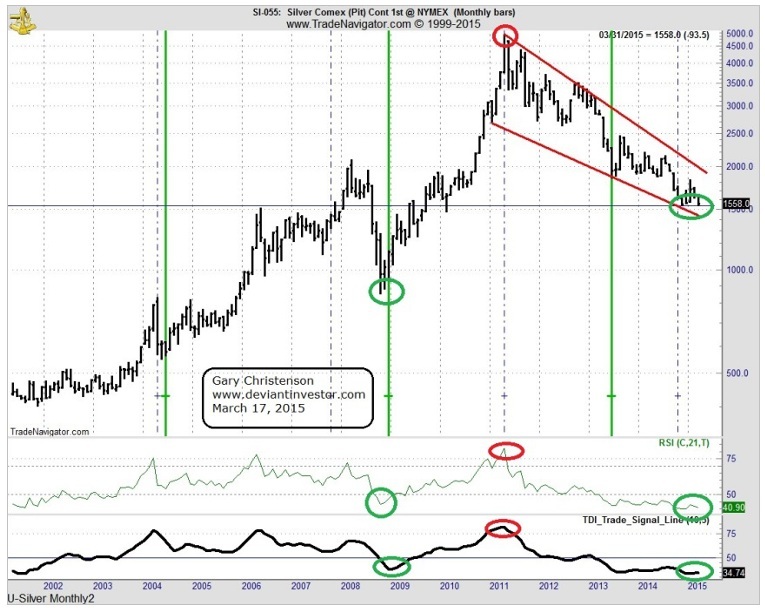 When silver prices are low so is the ratio, and when the ratio is high, look out below. Silver moves higher faster than gold and crashes more quickly, hence the volatility in the ratio. Examine the (smoothed) chart for the past 10 years as an example. The ratio is now quite low and so is the price of silver. History shows that exponentially increasing debt creates exponential increases in consumer prices, currency in circulation, and gold prices. Debt will increase – this is as certain as tomorrow’s sunrise – and gold prices will also increase, albeit erratically. Other analysts suggest gold and silver have not reached their final lows. They may be correct in the short-term (not my take), but in the long-term, prices for both metals will go substantially higher. Examine the monthly log scale chart of silver. Note the massive correction in prices, and the deeply oversold (monthly) condition of the RSI (Relative Strength Indicator) and the TDI. Prices have been ready to turn up for several months. Prices may not rally this week but they will soon. Stacking silver is good insurance. What could go wrong with our political and financial systems that might assist silver prices? The US recently sent 3,000 troops and 750 tanks and other military vehicles to Latvia on the Russian border. “Russia Starts Nationwide Show of Force:” 45,000 Russian troops plus war planes and submarines are performing military drills. Over 20 central banks have reduced interest rates in the past few months. They are not reducing interest rates because their economies are strong. Hint: more QE. Great Britain joined the Chinese backed Asian Infrastructure Investment Bank, clearly in opposition to US interests. Germany, France and Italy did the same. US influence is declining and Chinese and Russian military and economic influence is rising. How long will the dollar be the ONLY reserve currency in the world? When those excess dollars flood back to the US, after they are no longer needed elsewhere, how much inflation will that create for the U.S.?